We believe in one God,the Father almighty, maker of heaven and earth, of all things visible and invisible. I understand that there is one God, God almighty, and one God, the only son of God, and God is eternally begotten of God. And I understand that God became a man to do the will of God, and God was put to death to appease the anger of God, and now God sits at the right hand of God. According to Roman Catholicism, what does "proceeds" mean? Fr. Hardon, S.J., gives a good definition of "divine procession:"
The origin of a divine person from another through the communication of the numerically one divine essence. There are two internal processions in the Trinity: the begetting of the Son from the Father, and the procession of the Holy Spirit from the Father and the Son. It is divine persons, not the divine nature, who are the subjects of the internal divine procession. The second divine person proceeds from the intellect of the first divine person by generation, and therefore is related to him as Son to a Father. The third divine person proceeds from the will or mutual love of the Father and the Son as from a single principle through spiration. With regard to the words immediately succeeding: who proceedeth from the Father and the Son, the faithful are to be taught that the Holy Ghost proceeds by an eternal procession from the Father and the Son, as from one principle. This truth is proposed for our belief by the Creed of the Church, from which no Christian may depart, and is confirmed by the authority of the Sacred Scriptures and of Councils. Christ the Lord, speaking of the Holy Ghost, says: He shall glorify me, because he shall receive of mine. (John 16:14). We also find that the Holy Ghost is sometimes called in Scripture the Spirit of Christ, sometimes, the Spirit of the Father; that He is one time said to be sent by the Father, another time, by the Son—all of which clearly signifies that He proceeds alike from the Father and the Son. He, says St. Paul, who has not the Spirit of Christ belongs not to him. (Rom. 8:9). In his Epistle to the Galatians he also calls the Holy Ghost the Spirit of Christ: God hath sent the Spirit of his Son into your hearts, crying: Abba, Father. (Gal. 4:6). In the Gospel of St. Matthew, He is called the Spirit of the Father: It is not you that speak, but the Spirit of your Father that speaketh in you. (Matt. 10:20). Our Lord said, at His Last Supper: When the Paraclete cometh, whom I will send you, the Spirit of truth, who proceedeth from the Father, he shall give testimony of me. (John 15:26). On another occasion, that the Holy Ghost will be sent by the Father, He declares in these words: Whom the Father will send in my name. (John 14:26). Understanding these words to denote the procession of the Holy Ghost, we come to the inevitable conclusion that He proceeds from both Father and Son. The above are the truths that should be taught with regard to the Person of the Holy Ghost. 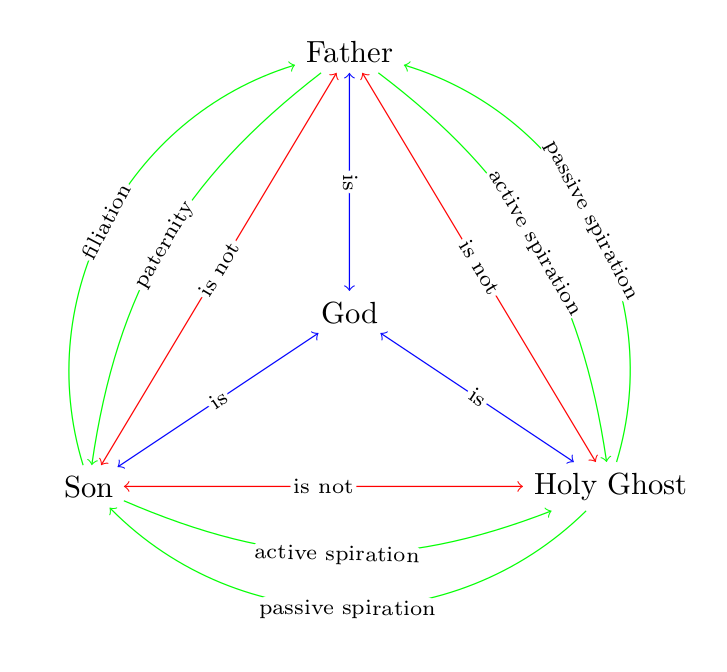 The procession of the Holy Spirit is one of the four relations in the Holy Trinity (cf. St. Thomas Aquinas's Summa Theologica I q. 28 a. 4). For more information, see Fr. Gilles Emery, O.P. 's works on the Trinity, e.g., The Trinitarian Theology of St. Thomas Aquinas ch. 5 "Relations" (p. 78 f.); cf. this answer. Not the answer you're looking for? Browse other questions tagged trinity pneumatology persons-of-the-trinity nicene-creed or ask your own question.